Mathieu Bellamont is a Breton assassin who lives in the Anvil lighthouse. Once a member of the Cheydinhal Sanctuary, his skills eventually earned him a promotion into the Black Hand, the leaders of the Dark Brotherhood. In truth, he has a personal vendetta against both the Night Mother and the Dark Brotherhood stemming from his mother's murder by Lucien Lachance by the orders of his father who had performed the Black Sacrament. He has apparently been plotting revenge, particularly against Lachance, for a considerable length of time; a plot which comes to fruition during the Honor Thy Mother quest. He always wears the standard Black Hand robe with the matching hood and a pair of doeskin shoes. He wields the enchanted dagger of numbing and a small amount of gold. Mathieu Bellamont will not be found anywhere in the game until the final stages of the quest Following a Lead. 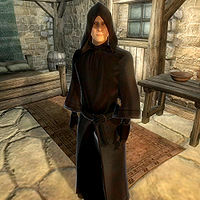 However, his treachery and insanity will influence the entire Dark Brotherhood quest line and cause a huge amount of death and suffering; his diary, found during the same quest, will provide an overview of his insane lust for vengeance, his hatred towards the Brotherhood, The Black Hand and Lucien Lachance—and will reveal his past and motives as well. Mathieu will remain hidden from the outside world and his true intentions and identity will be unknown for the longest time. However, the presence of a possible traitor is clear from the very first moment you set foot in the Cheydinhal Sanctuary. A worried Teinaava will say: "There are whispers in the halls of the Sanctuary. Some say there is a traitor among us. That the Brotherhood has been... compromised. ", while Ocheeva will say: "I... I've heard some talk. This past year, some family members have been found... murdered! Could there be an assassin among assassins?" Additionally, M'raaj-Dar will inform you: "The Black Hand is trying to keep it very hush hush, but one of their own has been assassinated! It would seem the Brotherhood has been infiltrated." I've been a part of their "family" for so long it's a part of me, whether I like it or not. And in all that time I've fooled them all. They see me as a fellow member of the Brother, a trusted family member. I've been switching them! Switching the dead drops! It was so easy! I tracked Lachance from his lair at Fort Farragut to the first dead drop location. After Lachance placed the orders, when I was sure he was gone, I switched them! It was so easy. Now Lachance's fool Silencer is working for us, mother! After you have slain Ungolim, a furious Lucien Lachance will run up to you, realizing that he is too late: "No! No, I'm too late! I thought I could get here in time, thought I could stop you! By Sithis, what have you done? What madness has claimed you? You have betrayed me, you have betrayed the Dark Brotherhood! Why? I am here to end your miserable life, to... But... I can see the confusion in your eyes. You... You have no idea what I'm talking about, do you? ", "Your first dead drop contract, you carried that out, killed Celedaen. After that, you eliminated the Draconis family, as ordered. Then, betrayal! Your dead drops went unvisited, your targets ignored. Instead, you have been systematically killing off all the members of the Black Hand! J'Ghasta, Shaleez, Alval Uvani, Havilstein Hoar-Blood -- Speakers and Silencers all. And Ungolim... the Listener himself! The surviving members of the Black Hand know that you're innocent, they know you were only following orders. They believe I am the traitor!" He will then task you: "The traitor somehow switched your orders, and has been sending you to the wrong dead drops. You and I have been deceived, dear friend. We must find out who is behind this betrayal! We haven't much time... I am hunted day and night by the Black Hand! They want me dead! Here is what you must do. Go now to your next dead drop, lie in wait, and confront whomever drops off the false contract! Uncover the true traitor's identity, and then come see me." When you confront Enilroth, the courier of the dead drop orders in Anvil, he will break down and say: "I'm... I'm sorry! I didn't mean to do anything wrong! It was the robed man! He... he paid me to put those things in the barrel! I don't know his name, and his face was in shadow. He called to me yesterday as I walked by the lighthouse. I think he lives there! Or he did, anyway. He told me he was leaving Anvil. I'm sorry, but that's all I know! ", "The lighthouse is... is just outside the city walls. I think the robed man has lived there for quite some time. In... in the cellar. I don't know what goes on down there, but there's a horrible smell coming from underneath that door. It's like... something died inside! Listen, that's all I know, really!" The Lighthouse keeper and Mathieu's landlord, Ulfgar Fog-Eye, will hand you the cellar key and say: "If you're here to kill that fellow in the cellar, then... good! I won't call the guards or nothing! He's doing... unnatural things down there! I heard the screams! And... and the smells! I never should have rented out that cellar! Never!" Entering the traitor's secret hideout underneath the Anvil Lighthouse makes it quite obvious that he is totally insane; flies are buzzing above several animal carcasses, human remains are scattered all over the floor and naked, and unknown human victims are placed atop cupboards and barrels. An equally insane crazed dog will provide a bit of opposition before you reach your goal; the traitor's diary and the macabre sight of the decaying head of "Mother", carefully placed on a pedestal and surrounded by lit candles. A bit of food and wine can be found amidst all the gore, with an iron war axe on the table. When you return to Lucien Lachance's hideout, Applewatch, you will finally meet Mathieu Bellamont himself, although still undercover. He is accompanied by three other Black Hand members, Arquen, Banus Alor, and Belisarius Arius; judging from the naked and mutilated corpse of Lucien Lachance dangling from the ceiling, the first part of Mathieu's vengeful scheme has fallen into place. An excited Arquen will fill you in on the Black Hand's triumph: "Silencer! At last you've arrived! Fear not, for the crisis that has threatened the Dark Brotherhood has finally come to an end." and "As you can see, we have dealt with the betrayer, Lucien Lachance! No longer will you serve as his puppet! It seems Lachance wanted revenge against the Dark Brotherhood for some reason, and used you to do his dirty work." When you get near Mathieu Bellamont, he will finally speak: "You are like an unholy vision. So beautiful." When approached, he will innocently greet you: "Hello, fellow Speaker. Welcome to the Black Hand. So nice to see you're in one piece." When asked about the now-dead Lucien Lachance, he will recommend a closer look at the "work of art" hanging from the ceiling: "You should take some time to admire his corpse. It really is a thing of beauty. The punctures and slashes are almost... poetic." No more conversation available, and when you leave him, he will comment: "May you always walk in the shadow of death." If you, however, brought his mother's head along to Applewatch and drop it before him, the stoic Speaker will be shaken, almost blowing his cover: "What... What is that? Is that a... a head? No... No, it can't be... I.... Um... Sorry, Speaker... I'm... distracted...."
Some day soon I will learn the truth about the Night Mother, and when I do, I will use that trust to get close to her. Close enough so that I may rend the head from her body, just as Lucien Lachance did to you so long ago! "You killed my mother! You ruined my life! I will destroy you all!" "My whole life I have waited for this moment! Die!" "We kill and kill and kill! All we know is death! It ends here!" "The Night Mother will fall by my hand! Her spirit will haunt my nightmares no longer!" "Die! All of you! Die! Agggghhh!" When Mathieu finally meets his demise and is reunited with his mother in the afterlife, the Night Mother herself will approach you and tell the rest of the tale: "So, at last we meet. I have been following your strange journey through the Dark Brotherhood, young one. You see, I have known of Mathieu Bellamont's intentions since he was just a boy. I knew of his thirst for vengeance. I could have informed my Listener. But I refused! Refused to reward such incompetence! Ungolim was weak. Indeed, I allowed Mathieu Bellamont to proceed on his destructive course. Just as I allowed you to intercept him." When asked for her reasons, she will say: "Our Dread Father foresaw your defeat of the traitor, here in this very crypt! You have been chosen!" In the game, it is stated that Mathieu is a member of the Black Hand. However, in the construction set, he is only listed as a Murderer in the Dark Brotherhood. The information listed in the summary box is the construction set faction, because this is the information that controls the NPC's disposition, dialogues, and responses to scripts; see Factions for details. His diary also reveals that Mathieu was responsible for the slaying of the entire crew of Serpent's Wake on the Anvil dockside. In Skyrim, Lucien Lachance's ghost will occasionally mention him: "Have you heard the tale of Mathieu Bellamont, and the great treachery of Cheydinhal? Kill a boy's mother, and vengeance festers in the son..."
Esta página foi modificada pela última vez à(s) 23h13min de 27 de outubro de 2013.